An overview of how higher education institutions can use GatherContent for the production, organisation & delivery of online course content. 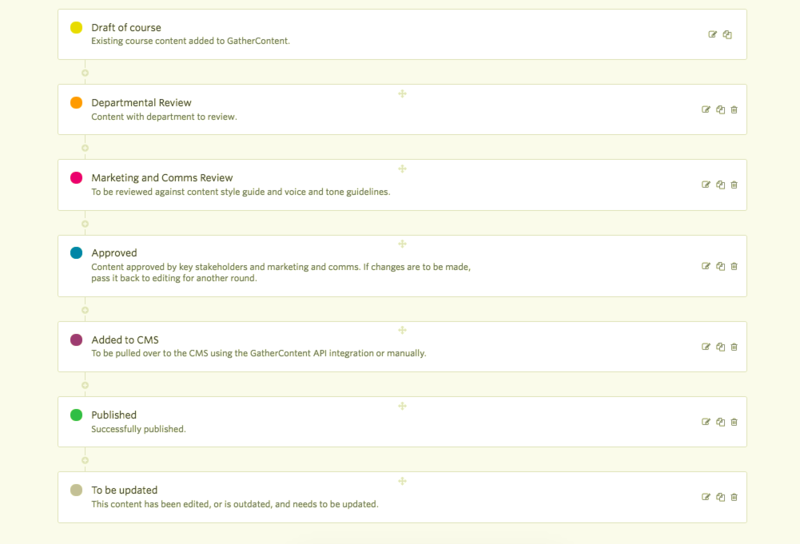 GatherContent can be used to centralise and manage ongoing content production. For example, if you’re creating course content with lots of subject matter experts and departments, you can ensure all of that content is created in one place. You can also use templates and guidelines to ensure that content is delivered in a consistent format that meets the style guide. Additionally, a bespoke workflow in GatherContent will ensure all of those involved will understand what they need to do and when. Let’s take a look at a sample account to show you how you can manage the production of campaign content. 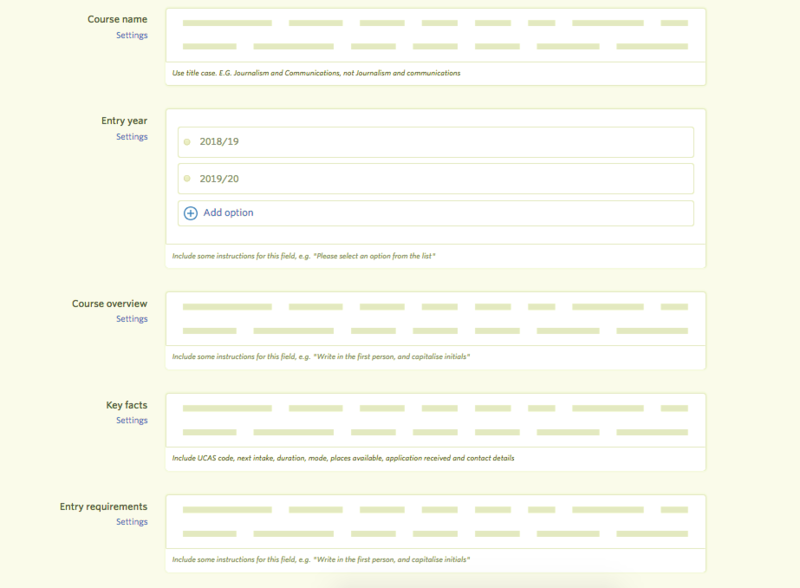 You can add each individual course as an item, or if you have a group of courses under one department such as the School of Geography and Planning, you could add the school as a parent item, and then the individual campaigns within that as child items. This means you can structure content by school, department, faculty or however best suits the structure or your organisation and content. Once your items have been added, you can create templates to add structure to them. You can apply a different template to each content type. For courses, if they follow the same layout and structure on the University website, you can create a template in GatherContent to mirror this. Templates mean that even if there are lots of people involved in the creation, review and editing of content, it will always be delivered in the correct format. You can apply a template to multiple items at once, saving lots of time! To ensure content is in line with your style guide, voice and tone, and brand personality, you can include guidelines as part of your templates to offer instructions for content writers, editors and reviewers to follow. You can also set word or character limits which will ensure the content maps nicely to your CMS. Once your content items have been added, a template created and applied and guidelines added, you can create a bespoke workflow for all those involved in campaigns. A workflow can be as simple or as detailed as you need, with colour coded statuses for an easy-to-see overview of where content is at. You can even add a workflow status specifying when an item of content needs to be updated. This allows for governance of content within GatherContent so it will always be the one true source for up to date and accurate content. The workflow will bring people together to ensure content is delivered on time. And with structured content, guidelines and a clear process, there will be fewer revisions and feedback loops, which means faster approval of content. People are intrinsic in the success of getting content delivered on time. 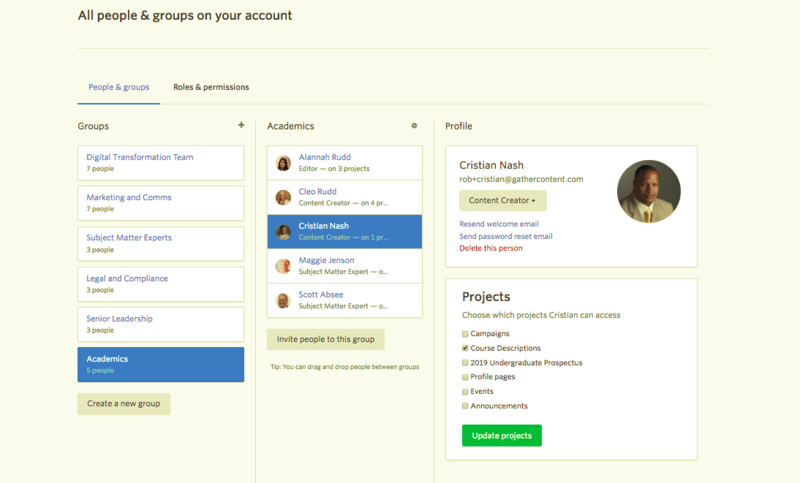 In GatherContent you can create different groups and add people to these groups. 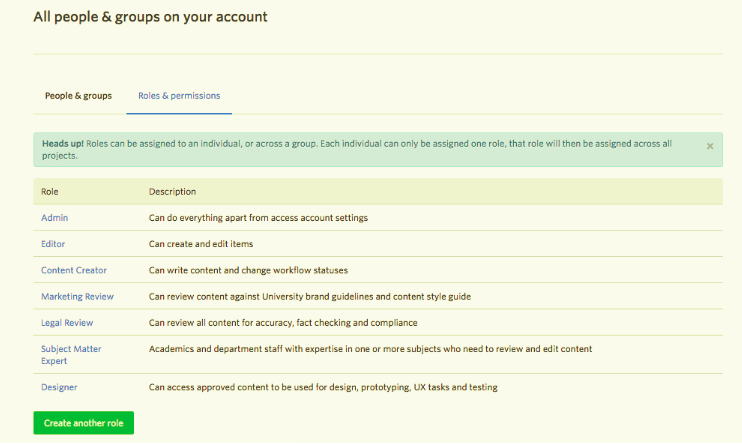 You can also control their permissions, ensuring they can only do what is needed of them in GatherContent. This means not only do you have a clear process for content, those involved know what they need to do and when. Collectively, this management of course content in GatherContent will ensure content is created, reviewed and approved efficiently, with effective content being delivered on time.